30 | TH E M R EP O RT COMPANY SPOTLIGHT KEY PERSONNEL Rudy Casanova Director of Global Sales Mark Matsuyma President Brian A. Flaherty COO Jun Lota SVP of Operations CONTACT INFORMATION Rudy Casanova Email: Rudy.Casanova@ globalstrategic.com Brian Flaherty Email: brian.flaherty@ globalstrategic.com 2326 S. Church St. Burlington, NC 27215 Phone: 855.732.4966 Web: GlobalStrategic.com GLOBAL STRATEGIC BUSINESS PROCESS SOLUTIONS, INC. COMPANY DESCRIPTION A custom business process solutions outsource provider, with 10 years niche experience in mort- gage servicing, default law, title, and real estate services. With strong experience in: indexing, loan onboarding QC review, REO, bankruptcy, title review, legal back office document preparation, billing, accounting(invoicing, GL, A/P), call center operations, and more. Each solution provided to clients comes with daily reporting, intellectual property protection, 24/7 access, and escalation to operations. With offices in Metro Manila, Philippines; Texas; North Carolina; and New York. Offshore operations executive man - agement team are U.S. citizens with an average 15 years' mortgage banking experience. 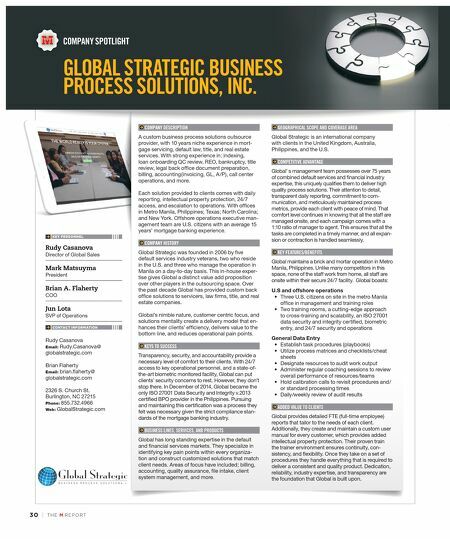 COMPANY HISTORY Global Strategic was founded in 2006 by five default services industry veterans, two who reside in the U.S. and three who manage the operation in Manila on a day-to-day basis. This in-house exper - tise gives Global a distinct value add proposition over other players in the outsourcing space. Over the past decade Global has provided custom back office solutions to servicers, law firms, title, and real estate companies. Global's nimble nature, customer centric focus, and solutions mentality create a delivery model that en - hances their clients' efficiency, delivers value to the bottom line, and reduces operational pain points. KEYS TO SUCCESS Transparency, security, and accountability provide a necessary level of comfort to their clients. With 24/7 access to key operational personnel, and a state-of- the-art biometric monitored facility, Global can put clients' security concerns to rest. However, they don't stop there. In December of 2014, Global became the only ISO 27001 Data Security and Integrity v.2013 certified BPO provider in the Philippines. Pursuing and maintaining this certification was a process they felt was necessary given the strict compliance stan - dards of the mortgage banking industry. BUSINESS LINES, SERVICES, AND PRODUCTS Global has long standing expertise in the default and financial services markets. They specialize in identifying key pain points within every organiza- tion and construct customized solutions that match client needs. Areas of focus have included; billing, accounting, quality assurance, file intake, client system management, and more. GEOGRAPHICAL SCOPE AND COVERAGE AREA Global Strategic is an international company with clients in the United Kingdom, Australia, Philippines, and the U.S. COMPETITIVE ADVANTAGE Global' s management team possesses over 75 years of combined default services and financial industry expertise, this uniquely qualifies them to deliver high quality process solutions. Their attention to detail, transparent daily reporting, commitment to com - munication, and meticulously maintained process metrics, provide each client with peace of mind. That comfort level continues in knowing that all the staff are managed onsite, and each campaign comes with a 1:10 ratio of manager to agent. This ensures that all the tasks are completed in a timely manner, and all expan - sion or contraction is handled seamlessly. KEY FEATURES/BENEFITS Global maintains a brick and mortar operation in Metro Manila, Philippines. Unlike many competitors in this space, none of the staff work from home, all staff are onsite within their secure 24/7 facility. Global boasts: U.S and offshore operations • Three U.S. citizens on site in the metro Manila office in management and training roles • Two training rooms, a cutting-edge approach to cross-training and scalability, an ISO 27001 data security and integrity certified, biometric entry, and 24/7 security and operations General Data Entry • Establish task procedures (playbooks) • Utilize process matrices and checklists/cheat sheets • Designate resources to audit work output • Administer regular coaching sessions to review overall performance of resources/teams • Hold calibration calls to revisit procedures and/ or standard processing times • Daily/weekly review of audit results ADDED VALUE TO CLIENTS Global provides detailed FTE (full-time employee) reports that tailor to the needs of each client. 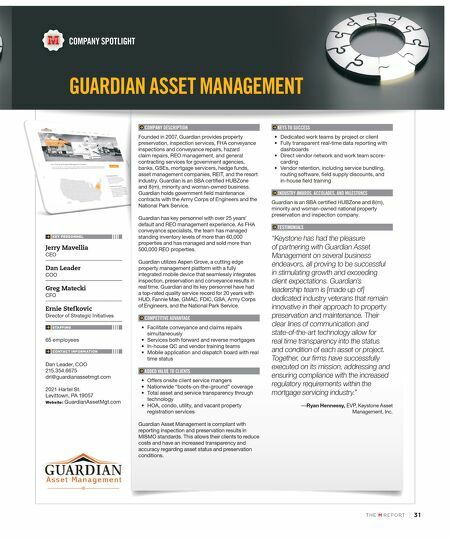 Additionally, they create and maintain a custom user manual for every customer, which provides added intellectual property protection. Their proven train the trainer environment ensures continuity, con - sistency, and flexibility. Once they take on a set of procedures they handle everything that is required to deliver a consistent and quality product. Dedication, reliability, industry expertise, and transparency are the foundation that Global is built upon.